Many people already know this about me but I am very picky when it comes to anime. So there for my anime list is short. I would love to find more to watch and finish (or even follow one that's still airing) but I haven't found one that I've fallen for in a long time. 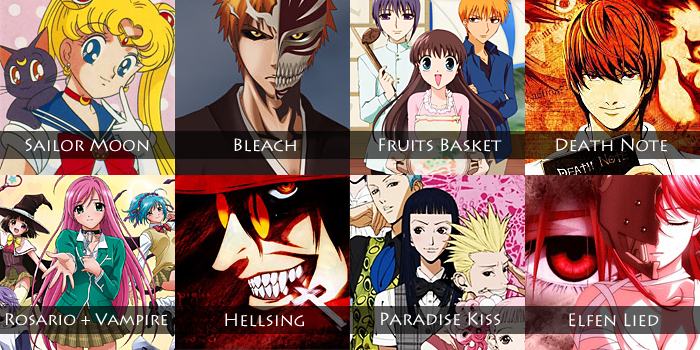 Only one below that I yet have to finish is Bleach. Which is surprising because it is the one I've been most obsessed about. And as always it feels like I've forgotten some but that's typical of me. Do you enjoy anime? What shows have you fallen for? I am very picky when it comes to anime also (my 'no' list is longer than my 'yes' one. lol)! I grew on My Neighbor Totoro, so I would say Miyazaki is a classic love when it comes to anime. As a more grown individual now, Rosario + Vampire was one of the first anime I watched all the way through. I've also enjoyed Sword Art Online and Fate Zero. I've started Fairy Tail (but that's a work in progress), am in the middle of Attack on Titan (enjoying it), and (although I'm still not sure how I feel about it overall) have watched Chobits too. I know the feeling with the longer "no" list lol! I love the Miyazaki movies I've seen so far! My favorite among them is Howl's Moving Castle. Many have told me to check out Fairy Tail, is it worth it? Howl's Moving Castle is a good one. If you haven't seen Castle in the Sky (Laputa), definitely check that one out too! Depends upon your watch style. if you're a dedicated watcher (who will only watch 1 anime at a time), then you've got quite the hill to take on. Fairy Tail has many episodes to catch up on. I'm still in season one (watching sporadically), but it's definitely one that I keep going back to in bite sizes. I've watched that one too, loved it :) ! The one I really want to watch of them now is Princess Mononoke! It's mixed...I like cute but with a message (like Fruits Basket for example) but I also enjoy more adult and horror like Hellsing (OVA episodes). Great list! I didn't click with Elfen Lied, and I haven't seen Rosario Vampire, but the rest are some of my go to's! Also, since you liked ParaKiss, have you seen Nana? It's based on another Ai Yazawa manga, and it is hand's down my FAVORITE story in comics (actually, its my 3rd fave ever, after Harry Potter, & Thursday Next). Hope you get to check it out! Let me know what you think about it! Thank you! I think many shows are something you either click with or not, like Elfen Lied. No I haven't watched Nana but read about it and been thinking of checking it out :) Will check it out for sure when I get the chance! Love your new blog and design ^^!